I have been washing my hair with rhassoul clay now for about a month. Not every time as it is more time consuming but it does work. Here are my good and bad bits from using rhassoul clay as a shampoo. 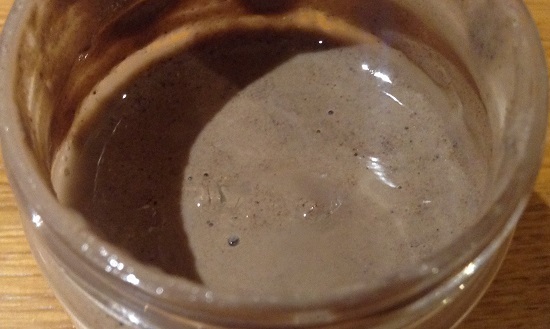 Rhassoul clay is just one ingredient and when you get down to it really, it’s just mud. You can’t get much simpler than that. Moroccans have been using rhassoul clay to wash for centuries and it’s great for both hair and body. You can also use it as a face mask and natural exfoliater. Anyone with sensitive skin or eczema, psoriasis or dry skin should try washing both their hair and body with rhassoul clay as it is just so good for the skin. Rhassoul clay is a natural anti-microbial as well as reducing hair loss, absorbing excess sebum and cleansing hair and body of toxins. It doesn’t dry my skin like normal shampoos can. I don’t get the dry flakes and tightness I usually get after washing so my scalp is much less angry and itchy too. Normally when I wash my hair it itches even in the shower and I have a bit of a dig. When I’m combing it out it’s nearly always impossible to avoid the temptation to use the comb or brush to have a good scratch of my scalp. I can’t help it, the best method being a plastic comb and a see saw action across the offending itching bit. Of course this doesn’t do the scalp any good but it sure feels amazing. When I’ve washed with rhassoul clay, like this morning, I never feel the need to scratch my scalp. I only just realised this today after a rhassoul wash. I don’t like washing my hair every day if I can help it, partly because it has terrible consequences for my scalp and partly because I don’t think it’s that good for my hair either. I can usually leave it for two to three days before washing. This depends on whether I’ve been for a run or how much emollients I’m using on the rest of my body as this can end up leaving my hair greasier much quicker. Of course a shower is essential after a run, so timing is essential. I usually go for a run when my hair needs a wash. The rhassoul clay gives a good shine (when I rinse with cider vinegar) and lasts just as long as normal shampoo. I often have to wash every other day and the rhassoul definitely meets that target of lastability (is this a word? it is now). If I’ve timed things right I can get away with another ‘hair up’ day and wait a little longer before it needs a wash again. It certainly doesn’t dry my scalp like some shampoos can so I feel it gives my scalp a breather in between the other shampoos I use. I buy my rhassoul clay from Natural Spa supplies and it costs just £20 for 500g. This may sound like a lot but you don’t need loads for each wash and as you use it you get better at gauging how much to use each time. I have spent a fortune on expensive shampoos over the years, none of which really help so to me, this price is amazing. Why spend over £6 on a bottle of shampoo which leaves your scalp dry, tight and itchy? That is crazy. This stuff works and you can wash your body with it too, more on that later. There a few annoying things about using this clay to wash, but with a bit planning they can easily be coped with. It does take me ages to wash using the clay. Not only do you need to mix up some clay with water; this doesn’t take long but can be a bit messy and every second counts when you have deadlines and trains to catch. It also takes longer to wash; once the clay is massaged into the scalp and hair it needs combing through and working in. Then it needs rinsing, before then pouring over the vinegar conditioner, which also needs combing through and rinsing with cold if you can bear it. When I’m in a rush I just don’t have time for this. In between rhassoul clay washes I’ve been using Barefoot SOS or Allergenics. Not just in the mixing, as mentioned above but also actually using it is tricky to get used to. You are getting gritty sloppy mud and rubbing it into your scalp and hair. It’s weird. If you have long hair like me it’s hard to get the clay through the thick layers of hair to the scalp beneath. I found that even though I was trying to spread it evenly, I ended up with areas smothered in the stuff and it’s not easy to move around and can get a bit sticky and cloggy if you put on too much. Just dip your head under the shower water for a second or two and begin massaging it in again if this happens. It’s definitely nowhere near as easy as just slapping on shampoo, lathering up and rinsing off. Lazy is my middle name. The clay can also get splashed over the shower screen and tiles and does need wiping off before it dries. 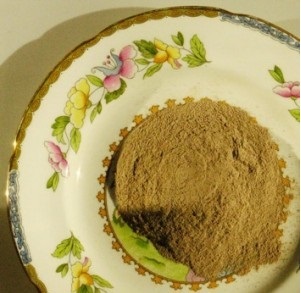 You can buy rhassoul clay online but you won’t find it in supermarkets or chemists. You will need to order enough and avoid running out, but nothing a bit or organisation can’t achieve. Hopefully health food shops may start stocking this soon, I keep asking the outlets near me to try stocking some. You can wash your hair without using a cider vinegar rinse but since the clay is very alkaline the ph is very different to hair and can leave it looking and feeling a but sticky and dull. Rinsing through with a mixture of cider vinegar and water solves this problem but if you have any broken skin or eczema when you do this it doesn’t have sting. The pain is gone pretty quickly though and once rinsed feels like nothing stung at all, and I think it will also help heal the scalp. Vinegar has many healing and cleaning properties. Has anyone else tried this yet? Did it help your scalp and eczema too? Does it work for psoriasis? I would love to hear from anyone else who has used rhassoul clay to wash their hair.